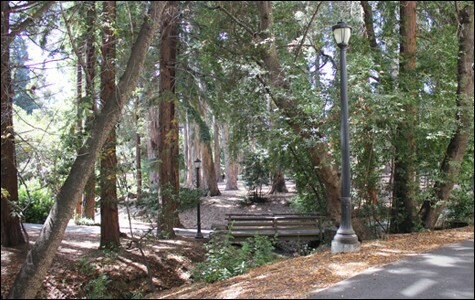 From libraries to eucalyptus groves, UC Berkeley has no shortage of inspiration environments. The Eucalyptus Grove behind VLSB: Isn't it pretty? 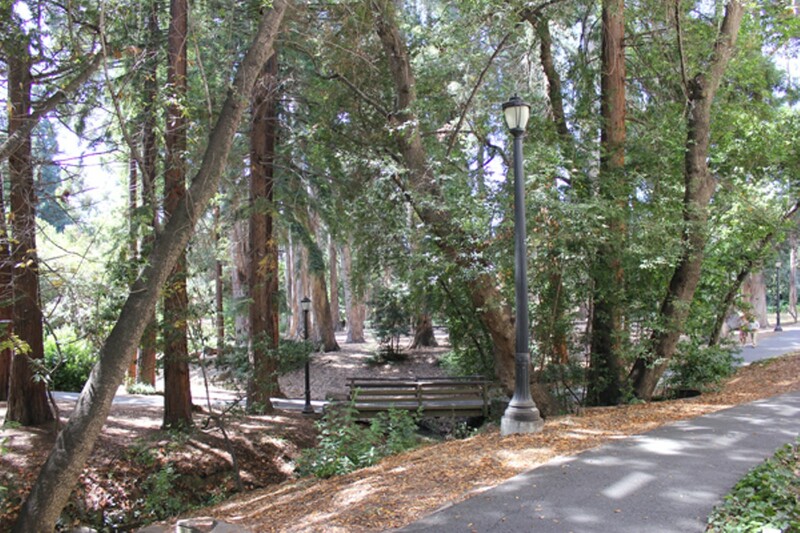 1) The Eucalyptus Grove: Follow Strawberry Creek behind Dwinelle Hall to this lovely stand of towering eucalyptus trees that lies behind the Valley Life Sciences Building. Stroll across the bridge over the creek, admire the sunlight coming through the trees, and get inspired. 2) Morrison Library: This grand, high-ceilinged reading room features comfy couches and chairs and an incredibly quiet, museum-like environment in which to read, study, or take a quick power nap. From 12:10 to 12:50 p.m. on the first Thursday of the month during the academic year, this is also the site of the excellent Lunch Poems series, at which acclaimed poets read their work for the public. 3) The Faculty Club: Okay, you'll need a friendly professor (or campus employee) to gain entrance to this place, but it's well worth it. Beautifully designed by architects Bernard Maybeck and John Galen Howard, the 110-year-old craftsman building features stained glass windows, fireplaces, and enough carved wood to make you feel like you've stepped inside some temple to Northern California. The lunch isn't bad, either. 4) Lipman Room: Barrows Hall may not be the most aesthetically pleasing building on campus, but its eighth-floor conference room is its best-kept secret. The room itself isn't much to look at, but its wrap-around balcony provides an amazing view of Oakland, San Francisco, and campus — the Campanile in particular. To access it, take the east-end elevator to the top floor. 5) Qualcomm Cybercafe: If you're looking to curl up on a comfy couch with your laptop and watch a huge flat-screen TV while sipping an iced mocha, then the little nook area of the cafeteria/Peet's Coffee & Tea in the west-end bottom floor of Sutardja Dai Hall is where you'll want to be. Just don't tell anyone else. 6) Terrace Cafe: Man, those engineering students have it good! Not only is there the aforementioned Peet's at nearby Sutardja Dai Hall, but there's also the Terrace Cafe on top of the Bechtel Engineering Center. Grab a quick bite from the cafe, then take a seat at one of the tables overlooking Memorial Glade, or, better yet, park yourself at one of the outdoor booths under the wooden awning. It's a great place to eat your lunch or do your homework without being confined by four walls. 7) Tree-Bench: Looking for some privacy and a little daring adventure? The tree bench on Tightwad Hill is the ideal spot for a first date. To get there, follow the dirt path that begins near Centennial Drive and Stadium Rim Way up the hill overlooking Memorial Stadium, and look for the tree with a bench built into it. Because it's on a steep hillside, it ends up feeling much higher up once you climb into it, than it looks from the ground. Just be warned: If you're drinking or smoking weed, getting back down safely can be a hairy experience. Careful!